U.S. Gold Corp. (NASDAQ: USAU), a gold exploration and development company, is pleased to announce the pending completion of the late Autumn 2018 drilling program at its 20 square mile, Keystone project, in Nevada's Cortez Trend. This drill program is testing several quality drill targets in areas of completed detailed geology, surface geochemistry, geophysics, and target synthesis. Up to this point in time, the bulk of the Keystone project area was inaccessible to drilling exploration because of severely limited surface disturbance restrictions of about 5 acres per 4 square miles of area. The Keystone Environmental Assessment (EA) and Plan of Operation (POO) were approved by the Bureau of Land Management (BLM) on September 7, and subsequent archeological surveys preparatory to road and site building were signed off by the BLM and Nevada Department of Environmental Protection (NDEP). Access and the drill sites were constructed, and drilling the six new sites is in progress. Dave Mathewson, U.S. Gold Corp.'s Vice President of Exploration, states: "Our Autumn 2018 Keystone drilling program is moving along. The weather has started to change at Keystone in Nevada and the snows have made us call a pending end to the program. We are pleased to likely complete the drill testing of 6 target sites in this late Autumn program (see attached map: https://www.usgoldcorp.gold/keystone-autumn-drilling.jpg). We will be eagerly awaiting the assay results and are hopeful to have all of them by mid to late January, 2019. We will keep the market updated as soon as results are in and analyzed." U.S. Gold Corp. is a publicly traded U.S.-focused gold exploration and development company. 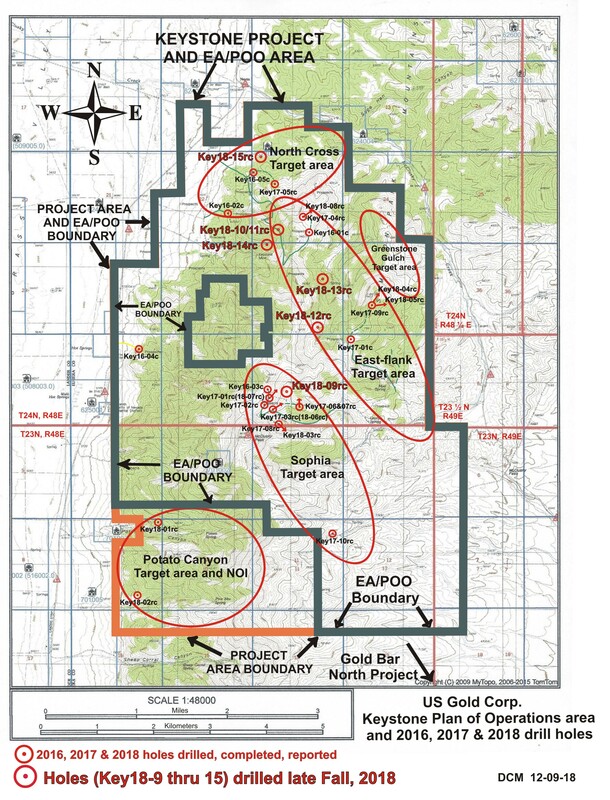 U.S. Gold Corp. has a portfolio of development and exploration properties. Copper King is located in Southeast Wyoming and has a Preliminary Economic Assessment (PEA) technical report, which was completed by Mine Development Associates. Keystone is an exploration property on the Cortez Trend in Nevada, identified and consolidated by Dave Mathewson. For more information about U.S. Gold Corp., please visit http://www.usgoldcorp.gold. Forward-looking statements in this press release and all other statements that are not historical facts are made under the safe harbor provisions of the Private Securities Litigation Reform Act of 1995. These statements involve factors, risks, and uncertainties that may cause actual results in future periods to differ materially from such statements. There are a number of factors that could cause actual events to differ materially from those indicated by such forward-looking statements. These factors include, but are not limited to, risks arising from: changes in the price of gold and mining industry cost inputs, environmental and regulatory risks, risks faced by junior companies generally engaged in exploration activities, and other factors described in the Company's most recent Annual Report on Form 10-K, Quarterly Reports on Form 10-Q, and Current Reports on Form 8-K filed with the Securities and Exchange Commission, which can be reviewed at http://www.sec.gov. We make no representation or warranty that the information contained herein is complete and accurate, and we have no duty to correct or update any information contained herein.